Diabetes Alert Day is Coming: Are You at Risk? Diabetes is a problem with your body that causes blood glucose (sugar) to rise to higher-than-normal levels – also called hyperglycemia. Normally, your pancreas releases insulin to help your body store and use the sugar and fat from the food you eat. 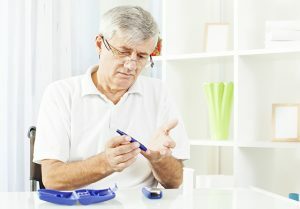 Diabetes occurs when the pancreas produces little or no insulin, or the body doesn’t respond appropriately to the insulin (a condition called “insulin resistance”). In the short term, your cells may be starved for energy. Type 2 diabetes usually gets worse over time – even if you don’t need medications at first, you may need them as the disease progresses. There is no cure for diabetes, but it can be managed. And many people with the disease live long and healthful lives. If left undiagnosed or untreated, diabetes can cause significant health problems. See your doctor if you experience any combination of these symptoms. The American Diabetes Association offers a free, anonymous risk test that can help you learn, in just 60 seconds, if you’re at risk for type 2 diabetes. Knowing your risk is the first step toward a healthier life. Take the test today. There are some things that affect your risk for diabetes that you can’t change, such as age, race, gender and family history. Diabetes occurs more often in Hispanic/Latino Americans, African-Americans, Native Americans, Asian-Americans, Pacific Islanders and Alaska natives. Men are also more likely to be at risk than women, and your risk increases if you have a parent or sibling with the disease. The National Institute of Diabetes and Digestive and Kidney Diseases offers a game plan for reducing your chances of developing type 2 diabetes, including a list of 50 tips you can try today. The American Diabetes Association offers a healthy living guide that can help you manage your condition and avoid or delay complications. You can download the guide or even request that a copy be mailed to your home. If you or a loved one needs support with your plan to live a healthful life with diabetes, FirstLight can help. Through our Companion Care Services, our caregivers can assist with medication reminders, healthy meal preparation and transportation to doctor appointments. They can also provide encouragement for getting active and can help with walks, gardening and other physical activities. To learn more, find a FirstLight location near you today. To get more health and wellness tips, follow us on Facebook.